The north Norfolk parish of Letheringsett with Glandford is situated just to the northwest of Holt. They were two separate parishes until amalgamated in the 20th century. Letheringsett’s name probably comes from the Old English for ‘Leodhere’s fold’, although, more attractively, the origins of the first part of the name may be from the Old English for sound or melody, perhaps alluding to the River Glaven. This latter interpretation is made doubly enticing by Glandford’s original meaning, ‘merriment ford’. In any event, both parishes have a long history and were certainly well established by the time of the Norman Conquest, their population, land ownership and productive resources being extensively detailed in the Domesday Book of 1086. The earliest evidence of human activity found in the archaeological record for the parish comes in the form of prehistoric, but otherwise undateable worked flint tools (for example NHER 25863 and 33566), but the oldest objects to which a definite date can be ascribed are Neolithic. Most of these are flint too, consisting of chipped axeheads (NHER 11179), polished axeheads (NHER 23244 and 28288), a flake (NHER 32856) and a knife (NHER 33566), but early pieces of Neolithic pottery have also been found to the west of Glandford (NHER 25863). The Bronze Age has left tentative evidence of the earliest structures. While nothing can be seen on the ground, aerial photography has pinpointed several ring ditches, possibly the cropmarks of the surrounding ditches of long since ploughed-out burial mounds (NHER 12793, 12825, 12826, 27944 and 32946). Candlestick Hill (NHER 3171) to the west of the parish was once thought to be a Bronze Age barrow, but is now known to be a natural gravel feature. Finds from the period to date include copper alloy axeheads, a spearhead, rapiers and a chisel (NHER 33796), another axehead (NHER 31167) and a flint scraper (NHER 34177). Examples of Iron Age objects found so far include pottery fragments (NHER 25863, 25948 and 33566), a brooch (NHER 33566) and an Iceni gold coin (NHER 28045). No evidence of structures remains from the period of the Roman occupation save for a roofing tile (NHER 33796), but finds from the time are quite numerous. Selected examples include coins (NHER 21565, 25596, 29422, and 30017), brooches (NHER 20208, 29422 and 34955), pottery fragments (NHER 25863, 25948, 31167 and 32855), a pendant (NHER 33796), nail cleaners (NHER 37193) and a harness fitting (NHER 29422). The Saxon period is also productive, with finds such as pottery fragments (NHER 25863, 25948, 33796 and 28045), quite a number of brooches (for example NHER 21565, 25860, 25863, 28045 and 36815), an unusual strap end (NHER 25982), a mount from a drinking horn (NHER 31596) and a very important Middle Saxon copper alloy mount for a book cover or a vessel, with a circular domed glass insert (NHER 31167). A group of undated rectangular enclosures and features are visible as cropmarks on aerial photographs. The features may be geological in origin, but they could be Early Saxon sunken-featured buildings (NHER 18101). Metal detecting to the east of Glandford in 2003 recovered an Early Saxon skillet and the find spot was excavated (NHER 39278). It was discovered that the skillet had been placed within an Early Saxon inhumation burial. The skeleton was of a male who was about 1.8m tall. As well as the skillet, he was accompanied by a spear, several pottery vessels, a knife, an iron-bound wooden bucket and two 5th or 6th century silver buckles. The Saxon period has left the parish with its oldest surviving building, St Andrew’s church in Letheringsett (NHER 6481). The round tower of this church is Late Saxon and features remnants of Late Saxon windows. The arcades are 13th century, the chancel dates to the 14th century and there is some 15th century stained glass. The 13th century font is made from Purbeck marble and the 19th century barrel organ was brought from Hindringham. Medieval finds include coins (for example NHER 25863, and 31596), pottery fragments (for example NHER 6157, 25863, 30017 and 31167), brooches (NHER 25982, 29422 30017), seal matrices (NHER 31167, 33566, 35447 and 35957), part of a papal bull (NHER 35957) and a gold ring (NHER 12255). The ruins of St Margaret’s church, Bayfield (NHER 6162) near Bayfield Hall, can clearly be seen on aerial photographs. It dates back to the 11th century, and was extended in the 14th and 15th centuries before it fell into disuse in the 17th century. St Martin’s in Glandford (NHER 6171) is a medieval parish church that was in ruins in the early 18th century. It was restored between 1899 and1908 for Sir Alfred Jodrell of Bayfield Hall (NHER 6176). The Lodge (NHER 6523) on Little Thornage Road in Glandford is a16th century house that was extended during the 18th century. Hall Farm (NHER 13448), north of Letheringsett, is a farmhouse, saw mill and associated farm buildings. The house was built around 1600 and refaced in 1870. There are two sets of 19th century stables, a 19th century granary, a goat house and a barn that was built in 1842. The sawmill was purpose built and contains a sawbench made in 1850. A turbine house is attached to the sawmill; the turbine inside drove machinery in the sawmill. Letheringsett Hall (NHER 6521) is a late 18th or early 19th century country house with associated buildings and structures. A set of 19th century stables incorporating a coach house and a dovecote stand close by. To the southwest is a 19th century pedestrian tunnel, which passes under the Holt to King's Lynn road. The landscape park (NHER 44219) associated with the house includes an orangery (NHER 17205), a summer house (NHER 42794), a water supply system (NHER 6519 and 42793) and a fountain (NHER 42796). Both Letheringsett and Glandford have the River Glaven running through them, and both have post medieval water mills on its course. Letheringsett Mill (NHER 6525) is a restored 19th century watermill. A mill stood on the site in 1720, but it burnt down and was rebuilt by 1754. The 1754 building also burnt down and the present building was erected in 1802. It was restored during the 1980s.The waterwheel and driving mechanism survive.To the north is Glavenside (NHER 44227), a former mill house. It was built around 1800 and extended in 1902. Glandford Mill (NHER 6170), marked on a map of 1797, has now been converted to residential use. The 18th and 19th century brewery and maltings at Letheringsett. Courtesy of <?xml:namespace prefix = st1 ns = "urn:schemas-microsoft-com:office:smarttags" />Norfolk County Council Library and Information Service. Letheringsett brewery (NHER 6522) is an important 18th and 19th century brewery and maltings complex. The surviving buildings stand around a courtyard and include a malthouse, a building containing two malt kilns, a tun house, cart sheds and Glaven Cottage (the brewer's house). Sections of the brewhouse remain, although most of it was demolished following a fire in 1936. 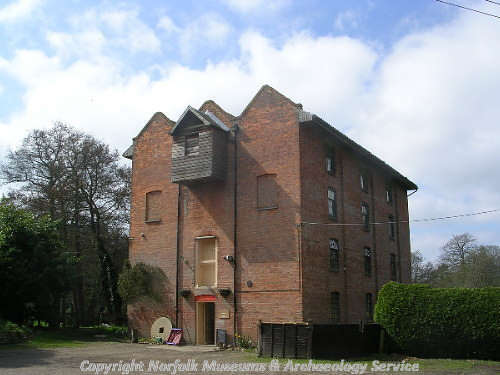 The complex had a waterwheel which was located in a tunnel passing under the malthouse and the cart sheds.The brick and iron road bridge on the Holt to King's Lynn road was built as part of the complex in 1818. 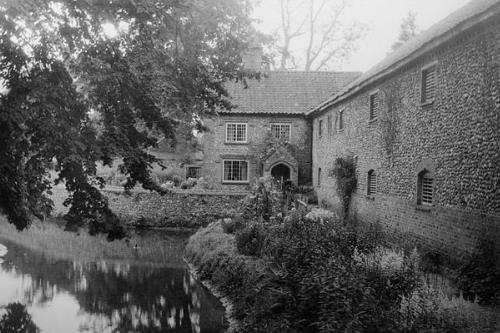 The Lily Pond (NHER 44223) was originally dug for use by the brewery, but also provided water to Letheringsett Hall. It was fed by a hydraulic ram (NHER 17280) in Letheringsett Park. Glaven Farmhouse (NHER 44226) to the southwest of Letheringsett is late 17th century with subsequent alterations.The main section has two storeys and an attic, while an additional bay has two storeys. Large fireplaces, beams and 18th century panelling survive inside. Just to the west of this are numbers 1 to 6 Thornage Road (NHER 44224 and 44225), a group of flint and brick estate cottages built in the early 1870s. Hobbs, Middle and Honeysuckle Cottages (NHER 44228) on Riverside Road are also estate cottages of about the same date. The former parish workhouse (NHER 17279) on Garden Lane is late 18th century. Meadow Farmhouse (NHER 24723) on Blakeney Road was mostly built in the mid 17th century and is probably dated by a plaque of 1664, although one gable may be earlier. A new façade was added during the 18th century and in the 19th century an extension was added. Associated farm buildings date to the 18th and 19th centuries. The Midland and Great Northern Joint Railway North to South Line (NHER 13584) passed through the parish. This was the route of a 19th century railway from Norwich City Station to Cromer.To the east of Glandford is the site of a World War One airfield (NHER 13549), which can be seen on 1946 aerial photographs. The proximity of the parish to the coast meant that it was incorporated into the massive anti-invasion construction programme carried out in World War Two. Most of these defensive structures were cleared away after the war, but survivals include two anti-tank mortar bases (NHER 32450 and 32452), a Home Guard shelter (NHER 32451), rare Allan Williams turrets (NHER 32456 and 32457) and a radio direction-finding post (NHER 23141). Piet Aldridge (NLA), 7 February 2007.